What interests me most about this paradigm is the way it changes our behaviour: it maintains the experience of having the things we like to use (from a Missoni cocktail dress to the occasional game of Scrabble) without the cost, physical space, or materials to own these items and only use them once in a while. There is a social element as well: If I’m borrowing items from people nearby, I have a new way to get to know my neighbours. We develop a shared sense of responsibility and identity. It’s a digital way to create a community feeling in neighbourhoods, particularly in big cities where these kinds of opportunities have been lacking. Changing our behaviour changes the way we think, and ultimately, our values. The use of social media spread the idea that everyone has a voice and enabled young people to demand democratic ideals from their governments. 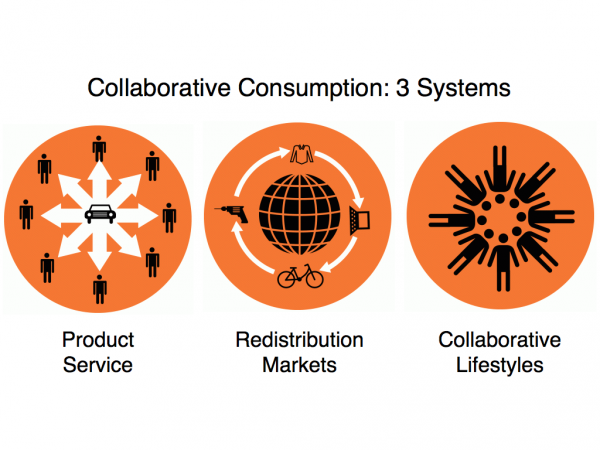 If the sharing economy becomes mainstream, then what will it do for sustainability, community, and the future of consumption? I hope to see the shared economy help us adapt a more sustainable and collaborative lifestyle.